Maiuri was a long term and influential Director of the Excavations at Pompeii, Herculaneum, and surrounding areas -- served as director from 1924 - 1961. Pompeii and Herculaneum were thoroughly buried by the eruption of 79 AD. Pompeii appears to have been abandoned except by scavengers -- either owners returning to try to recover items of special value, or looters on similar missions. A new town was eventually built over the ruins of Herculaneum, but Pompeii was not resettled until it became the tourist attraction that it is today. 1. Vitruvius in De Architectura (date uncertain, but he died in 20 BC) had written: "Not less also let it be recorded that heats in antiquity grew and abounded under Mount Vesuvius, and thence belched forth flame round the country" (Book II, Chapter 6, Para 2) Vitruvius described both the characteristic "pozzulana" (i.e., Puteuli = Pozzuoli) sand, which he found good for making hydraulic cements and the pumice found in the area, both of which he ascribed to volcanism. 2. Virgil, in 19 BC, included in his Aeneid the long-standing myth that the giant, Mimas, was buried under Vesuvius by the god Hephaistos (Vulcan) and the brother of Mimas, Enceledus, was buried under Etna in Sicily. Earthquake were his struggles to rise, rumblings his plaintive voice, and eruptions his flaming breath. Like today, Etna was perennially active in ancient times, so there could be no mistaking the meaning of the ancient myth: Vesuvius was also a Volcano. 3. The Greek historian Strabo, in 9 AD, that Vesuvius "possesses craters of fire that go out only when they lack fuel". In addition, there had been numerous earthquakes including big quakes in 62 and 64 AD. These two major quakes virtually knocked down Herculaneum and Pompeii. Both cities were undergoing large-scale reconstruction at the time of the 79 AD eruption. Most damaged temples were not rebuilt by 79 AD, but the Isis temple was quickly rebuild and sumptuously decorated. (Similarly, "Egyptian" mythological representations were widely represented in private and public buildings.) Isis was on the rise and Roman "pagan" religion was rapidly waning, and that could have been one reason why the pagan Mimas myth might have been unknown or ignored. The rebuilt structures, including the Isis temple, were in mint condition when they were entombed, giving us a snapshot of building methods, decoration, and lifestyles. Maiuri -- the long-term site director (1924 Ð1961) maintained that the earthquakes upset the social order in the cities and that a new middle-class displaced the Patrician elites, even to the extent of taking over many of their houses. Very recently, Maiuri's "social" interpretation (and many others of his conclusions) has been persuasively challenged. More on this later. What did the looters, excavators, and archeologists have to dig through? Burial of the cities was quick and deep. 2.4 meters of ash mixed with small pumice clasts fell during the Plinian phase. Then a few inches of mixed debris -- tiles, bricks, broken masonry, etc. from the first pyroclastic surge. This was the layer in which the victims who were outside were found -- knocked down and killed instantly by the extreme high temperatures. Then another 2.5 - 3 meters of ignimbrite deposited by one or more pyroclastic flows. People who were inside were killed rapidly (unconscious in a few seconds) by the extreme high temperatures. The flows arrived only a few seconds after the surges: most volcanologists, as we have seen, talk about linked surge/flow pairs -- you can't get one without the other because they are, in fact gravity-differentiated aspects of the same phenomenon..
Interestingly, it appears that the first surge/flow pair stopped against the walls of the city of Pompeii -- not because the walls were especially strong but because the surge/flow just came that far. Because the ash-fall had already buried things up to 2.4 meters deep, it was at that level that everything was broken off and destroyed by the surge that swept over the city. That meant that buildings lost upper stories if they had any. Walls that were perpendicular to the direction of the surge were knocked down, but some few walls that happened to be parallel to the direction of the surge survived. The surge and flow acted like a liquid (i.e., fluid mechanics determined where it went) so they did eddy around structures: it wasn't at all safe to hide behind something or inside a structure. And also, of course, the ambient temperature could have instantly risen to as much as 1000 degrees F. depending on how close you were to the origin of the surge/flow. No later lava flows from effusive eruptions of Vesuvius reached as far as Pompeii, and only thin layers of ash reached that far. The ash fallout missed Herculaneum because the wind was blowing the other way. Contrary to what you might have heard elsewhere, Herculaneum was not just buried by Lahars (mud flows). There are at least five surge/flow pairs everywhere at the Herculaneum site, and six pairs at most places. The first pair reached almost to the old coastline and the next five overwhelmed the whole city. Since only the area near the old coastline has been excavated, it's possible that additional pairs might exist further inland. It appears that part of the population of Herculaneum made their way to the shoreline during the Plinian (ash-fall) period of the eruption (the first 10 -- 12 hours, which almost completely missed Herculaneum) in the hopes of escape by sea. They would have been at the water's edge below the lip of a previously existing ignimbrite cliff. It's possible that some could have survived the first surge/flow pair, which barely reached the shoreline. Shortly thereafter, the second much bigger and more energetic pair would have overwhelmed everyone, even those who had sheltered in the boat storage areas cut into the cliffs -- fluid mechanics (and the Coanda effect?) would have ensured that the storage areas would have filled with pyroclastic material. The shoreline at Herculaneum was extended outward by more than half a kilometer by the accumulated volcanic matter from the 79AD eruption. At the old shoreline (where most of the actual excavation, as opposed to tunneling has taken place) there is an overlay of 20 meters. Herculaneum was originally built on a layer of ignimbrite from a previous eruption -- probably from the Campi Flegrei rather than from Vesuvius. The site of the city actually ramped upward slightly toward the seacoast. That upward ramping, along with the 20 meters of 79 AD deposits, makes the site higher than surrounding areas, so lavas from later effusive eruptions of Vesuvius have flowed around the site. Minor ash falls from later Vesuvius eruptions overlay the 79 AD ignimbrite layers. Why dig at all? And why is Pompeii so popular? Archeology is popular today mainly because of the movies. Everyone knew what had happened -- the sound was loud enough to be heard in Rome, and the Plinian column was visible from Rome. The Historian Tacitus wrote about the eruption -- but his description is lost to us. We know he researched the subject because of Pliny's letters, which have been preserved. He may have had other eyewitness accounts. "Looters" holes are not uncommon, although we are not really sure whether they were made by looters, or rescuers, or owners trying to recover their buried property. It also has been suggested that some might have been made by people trying to escape, but that explanation doesn't take into account the speed of death that accompanies superheated flows. The Fontanas were the favorite architects of Pope Sixtus V (Felix Peretti, Pope from 1585-90). Major projects in Rome -- erecting the Egyptian Obelisks, including the one in front of St. Peters undertaken by Domenico. His brother Giovanni made the Aqua Felice ("Felix's aqueduct") work after other architects had botched the job by mis-figuring the slopes of the water channels. Domenico was hired by Count Muzziu Tutavilla to bring clean water down from the hills to family lands and towns on the Bay of Naples. Tunnels for the Sarno/Foce aqueduct passed right through the Pompeii site (right over the top of the amphitheater) and through the ruins of the city. Apparently nothing of value was seen, so no digging was undertaken. Locals called the site "La Civita" or "La Citte" but did not know it was Pompeii -- it was known that there were ancient Roman ruins -- mostly villas -- scattered about. The top, i.e., the outside of the stones that were put in to support the top of the tunnel, can still be seen in Pompeii, where the volcanic debris was later removed. Inscriptions were tuned up, one of which mentioned "decurios Pompeiis". A noted Neapolitan architect, Francesco Piccheti, mis-identified the site as the villa of Pompey the Great, Julius Caesar's opponent in the Civil War of 51 -- 47 BC. Another scholar, Francesco Bianchini, correctly identified the site as Pompeii, and four years later, Giuseppe Macrini did some exploratory digging and found the outer walls of the city -- clearly city walls of a type that would not have been around a villa. Nonetheless, Piccheti's views won out, and academia did not believe the Pompeii identifications. Workers dig right into the seats of the Herculaneum amphitheater. The local Prince, Emmanuel-Maurice duc d'Elbeuf, got wind of the discovery and within a few years was mining the site to build and decorate his Villa on the Bay of Naples, first for marble (amphitheater seats) and the for statuary and frescoes -- beginning of a long tradition of looting by the nobility. Most of this was concentrated at Herculaneum. Pompeii, 1748, Roque Joachim de Alcubierre, a Spanish military engineer working for Charles III (VII) Bourbon y Farnese, King of Naples. The Herculaneum "mine" was playing out, so Alcubierre looked elsewhere -- investigated local lore and came up with the idea of digging in "La Citte". Alcubierre's work was heavy handed and destructive, and, of course, not documented (Although the ancient Romans had dug and documented (and collected and looted) the documentation tradition had been lost.) Alcubierre only recorded important finds (that were literally "noteworthy" -- and threw almost everything else back into the pits, which he promptly backfilled with debris from his next excavation. Digging in the loose overlay of Pompeii was much easier but also was much more dangerous than in the consolidated overlay at Herculaneum -- landslides, cave-ins, and poison gas pockets ("mofeta") took their toll. Pompeii, 1750, Karl Weber, a Swiss military engineer, arrives -- "co-Director" with Alcubierre for Charles III. Weber attempted to rationalize and document, but the artistic and architectural (and precious metals and stones) "treasure" was what Charles really wanted to collect, so Alcubierre could often over-ride Weber whose efforts seemed to be slowing down the discovery of valuables. Weber, nonetheless, sometimes had his way and even dragged the King out to the digs on occasion. At any rate, Weber's maps, plans, and documentation survive. Charles was, of course, a very successful collector of Pompeian and Herculaneum art and artifacts. His collection was the basis for the National Archeological Museum in Naples. La Vega was Weber's worthy replacement -- worthy because he was the first ot understand the tourism value of Pompeii. Excavated areas were preserved and documented, guides were published, and the great art of Pompeii and Herculaneum was illustrated into scholarly volumes. It's clear that there was even advertising, and distinguished visitors -- popes, princes, scholars -- started to show up. An early triumph of La Vega (1764) was the discovery and excavation of the Temple of Isis -- it had been one of the few Pompeian temples reconstructed after the 62/64 earthquakes and it was in a very good state of preservation. It had been brand new when buried. The decoration of the Isis temple and the clothing shown in the temple frescoes (and in other Egyptian/Isis influenced decoration in Pompeii) had a great influence in Europe. When Napoleon came to power in France (he was born in 1769 and reached the height of his power around 1800) Napoleon, who fancied himself as the new Roman Emperor, emulated the (Egyptianised) decor of Pompeii and the women of his court wore the "Empire" style copied from the Isis temple frescoes. Napoleon's forces took Naples in 1798 and Joseph Bonaparte became King of Naples. He was interested in the archeological sites and hires Michele Arditi to create and excavation plan -- essentially to uncover the city walls and work inward toward the center. This plan stayed pretty much in effect until recently when the current director decreed that there would be no new digging (except downward) until already-exposed material was consolidated -- more on that later. Joseph was eventually pulled out to take over the Monarchy in Spain, and the Kingdom of Naples was given to Marshal Joachim Murat (Marshal 1804, King of Naples 1808-15). Murat married Caroline, a Farnese heiress. (The mother of Charles III had also been a Farnese -- Elizabeth -- so Caroline brought some continuity to the Neapolitan throne). More importantly, Caroline brought old and real money to the Kingdom's treasury, and she had some influence on how it was spent. She financed extensive digs at Pompeii and was the patroness of the Charles Francis Mazois Les Ruines de Pompeii, a three volume set book on everything that was then known about the city. Caroline also brought many of the Farnese treasures -- art and statuary of ancient Rome from the Farnese family collections -- to Naples where they still remain in the National Archeological Museum. Her marriage to Murat did lead to some legal complications concerning the return of art works that were transferred from Naples to Paris during Napoleonic period. The Congress of Vienna ended Murat's reign and the "good old days" of Carolinian Patronage. The digging continued unabated, but not at the rate she had sponsored. In 1860 Garibaldi conquered the Kingdom of Naples and almost immediately turned it over to the united Kingdom of Italy. Garibaldi was left in charge of the Neapolitan province, and he appointed Alexandre Dumas, the author, as Director of Excavations. Dumas had, by that time produced over 250 books and 15 plays, but he had no experience with archeology (Yes, 250!, but Isaac Azimov produced over 500 books in the 20th century.) Dumas acknowledged 73 "assistants", who helped him write. Mau was never site director, but his 25 years of archeological campaigns in Pompeii had a great impact on how the site and Roman art history in general have been interpreted. The division of Pompeian art into four "styles" is usually considered his most important contribution. We'll look at this in detail in a later unit on Pompeian art and architecture. Fiorelli was appointed in 1863 (under Dumas) to head the dig at Pompeii. He already had wide experience at Pompeii and elsewhere. Fiorelli introduced modern archeological principles: stratigraphy, in particular, enabled him to deduce the presence and uses of upper stories, which had collapsed. Fiorelli developed the locator system of naming locations by "regions, blocks, and doorways", the system still in use today. Fiorelli was promoted and transferred to national archeological responsibilities in Rome in 1875, but he had established a working regime that has lasted in most respects until the present time. Spinazzola's major accomplishment was the initiation of restoration and preservation projects carried out simultaneously with new digs. He has been criticized for digging out only the front facades of buildings along major streets without supporting them. This procedure did, however yield a good deal of new knowledge about ancient building methods, town planning, and, in particular, the uses to which second stories were put. He was removed in 1924, apparently because he would not kowtow to Mussolini's nationalist and ideological interpretations of the Roman Empire -- he thought and said that Mussolini was a fool. You either love him or hate him. Maiuri started with two strikes against him: he had replaced an efficient and popular director, and he was considered to be Mussolini's man. In fact, only the first was of any consequence at the time that he took over the job: it was very popular, at the time, to be Mussolini's man. 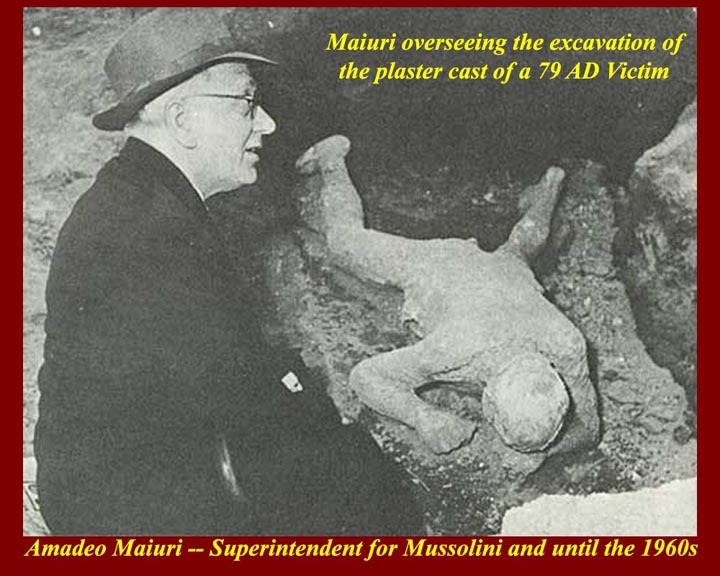 We will never know whether Maiuri really was a fascist ideologue, as his detractors say, or whether, like so many others, he simply did what was needed to get his job done. In terms of sheer mass, Maiuri certainly moved more dirt than any other Pompeian excavator. From the beginning, his methods were modern and scientific, especially in stratigraphy, context, and record keeping. He was often (even after Mussolini) under great pressure to produce impressive finds, and his critics claim that this became habitual -- that he wanted great finds even when the pressure eased off. Maiuri had what some critics called a Fascist economic agenda, which amounted to demonstrating that the old Roman patrician faction of Pompeii had been displaced by a new mercantile class by the time of the 79 AD. The reason for this change was the destructive series of earthquakes in 62 - 64 AD from which, Maiuri maintained, the upper class never recovered. The symptoms of the change were many, but two were most easily detected. First was a supposed change in decorative art styles in homes and public buildings, the advent of the "fourth style" -- actually a conglomeration of the "second" and "third" styles (much more about the four "styles" in a separate unit). Maiuri considered the fourth style degenerate and said that its advent indicated that a degenerate class had taken over. His high estimate of Pompeii's population at the time of the eruption: that 20,000 figure that is often used was his. Many recent scholars have gone toward the lower end, around 6000. His overestimation of the number of houses that had upper floors and the assumptions about uses for those rooms: he thought many were rented apartments. The connection between the number of doors an stairways in large houses with the number of families living in the house. His views on the use of living space by the ancient Pompeian familia or extended family, which would include relatives, slaves, freedmen, employees, candidates for adoption, and possibly others. The presence of transient or permanent guests as well as the daily obeisance of clients was also a factor. Maiuri also stands accused of selective publication and even selective preservation of artifacts and structures. This criticism, however, is more a function of changing priorities (and to some extent "political correctness") than of "bad archeology" by Maiuri. The latest fad in archeology is to discover and publish what all classes and levels of ancient society were up to, and that's very different from what was considered important in earlier days. [I tend to sympathize with Maiuri on this last point: it's nice to know (actually conjecture) what the lower classes did and how they lived, but, because they were "unimportant" in their own time, evidence about them is harder to find and, therefore, accurate deductions about them are harder to make. Also, the lower classes, especially in ancient times, seldom had much effect on "history", i.e., on the events and circumstances that had effects and set parameters for later days, including our own. For example, our own founding fathers, in setting up the American Republic, worked from the upper class pattern of power sharing of republican Rome (before the tumult of republican Rome's last century). They might not have had an accurate perspective on Roman life, and they certainly were not "politically correct", but the historical fact remains that they worked from the upper class pattern. It's also important to remember that the source of most criticism of earlier scholarship , including Maiuri's, comes from non-representative leftist academia, and to remember the old adage, "Those who can't do, teach." A final note on Maiuri: It has been asked whether Maiuri reached an accommodation with the Camorra, the Neapolitan criminal organization, which is akin to but more institutionalized than the Mafia. The answer, of course, is another question: "Are you talking about Naples?" Fausto Zevi, 1977 -- 81. Superintendent of É etc. A major earthquake shakes the region doing great damage to Pompeii and Herculaneum. Both sites were closed for safety surveys, and Pompeii requires extensive structural repairs before reopening. Some areas are still closed to the public today. There was, of course, ex post facto sniping after each change took place. In the modern Italian fashion, Conticello was actually indicted for his "crimes" of favoritism and not following procedures. The big problem is always money. There is never enough, and there is always what is quaintly known as wastage -- some of it disappears. Natural disasters -- another eruption in 1944 and a big earthquake on Nov 23, 1980. Both Pompeii and Herculaneum were bombed in the two 20th century World Wars. It's still Naples, so there's still corruption. All major expansion of the exposed area (two-thirds to three-fourths of the city, depending on who's counting) has been stopped while conservation, preservation, documentation, cataloguing, etc. is supposed to catch up. Herculaneum's Villa dei Papiri -- should there be more digging? The state of the Volcano -- when will it pop again, and how devastating will it be? How should that effect the pace of excavations?